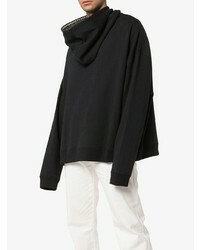 Wear a Raf Simons oversized front hooded cotton jumper and black jeans for a casual level of dress. Got bored with this ensemble? Enter black leather chelsea boots to change things up a bit. 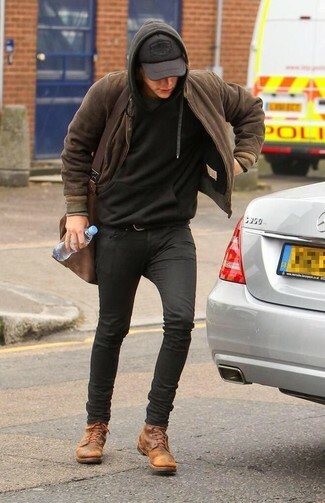 If you're in search of a casual yet seriously stylish look, choose a black hoodie and black leather jeans. Both items are totally comfortable and will look great paired together. Feeling inventive? Complement your getup with black leather derby shoes. 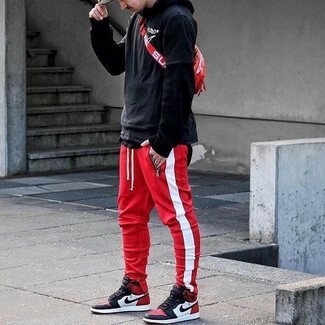 We all seek comfort when it comes to dressing up, and this combination of a black hoodie and red and white vertical striped sweatpants is a perfect example of that. 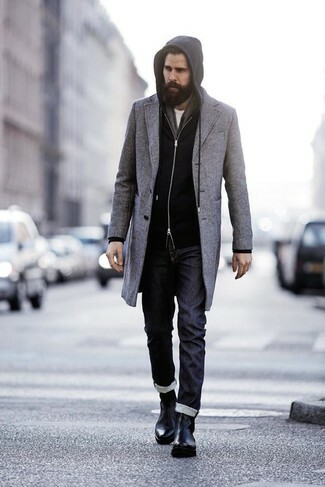 When it comes to shoes, this look is complemented well with red and black leather high top sneakers. 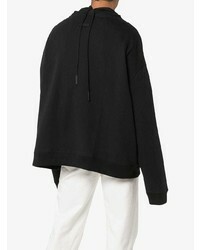 For a casually elegant look, go for a Raf Simons oversized front hooded cotton jumper from farfetch.com and grey wool dress pants — these two pieces play really great together. Black athletic shoes will add a casual vibe to your getup. 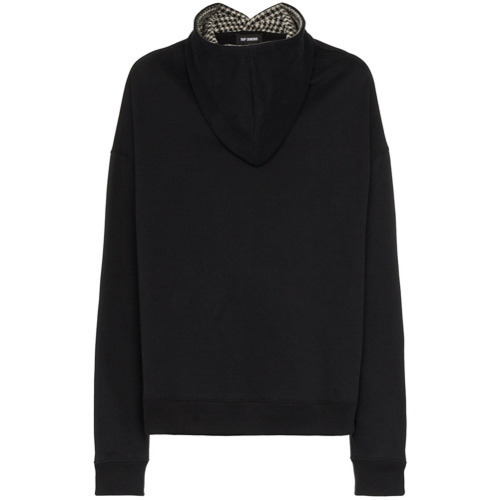 If you're a fan of functionality dressing when it comes to fashion, you'll love this easy combination of a Raf Simons oversized front hooded cotton jumper and black skinny jeans. Up the cool of your look by finishing off with tan leather casual boots. If you prefer relaxed dressing when it comes to your personal style, you'll love this on-trend pairing of a Raf Simons oversized front hooded cotton jumper and grey ripped jeans. 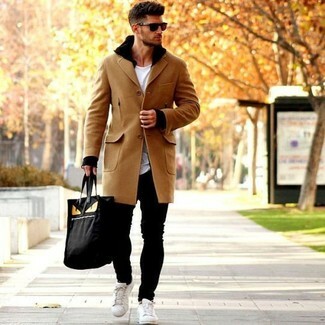 Throw in a pair of tan suede chelsea boots for a masculine aesthetic. Consider wearing a Raf Simons oversized front hooded cotton jumper and black skinny jeans, if you want to dress for comfort without looking like a hobo. Kick up the cool of your ensemble by finishing off with white low top sneakers. 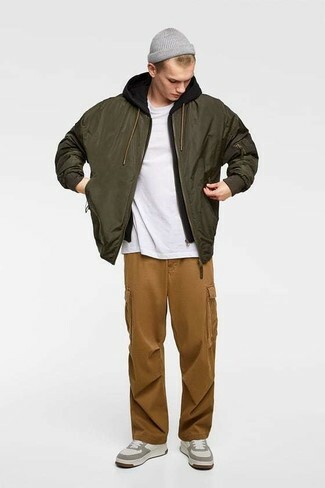 No matter where the day takes you, you'll be stylishly prepared in this casual pairing of a Raf Simons Oversized Front Hooded Cotton Jumper and brown cargo pants. Add a dressed-down twist to an otherwise mostly dressed-up ensemble by finishing with a pair of beige suede athletic shoes. 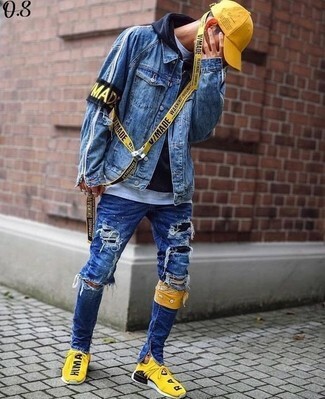 If you're all about relaxed dressing when it comes to fashion, you'll love this neat pairing of a Raf Simons oversized front hooded cotton jumper from farfetch.com and blue ripped skinny jeans. Finish off this look with yellow athletic shoes.